A major Royal Navy and police search carried out near Dumfries has been blamed on sightings of a comet. The alert was raised at about 1700 GMT on Friday when police operators started receiving calls about a "burning light" spotted above the town. Two navy helicopters and police officers checked the area over fears an aircraft might have been on fire. 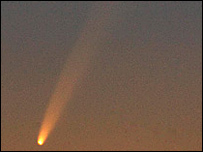 A police spokesman said the Met Office had suggested Comet McNaught would have been visible in the area at the time. The sightings were focused on the Lochar Moss on the outskirts of the town. Police sent out officers to check the area and two Royal Navy rescue helicopters were called in, carrying out a two-hour search. A police spokesman said the Met Office had offered a possible explanation - that the sightings were of Comet McNaught, which would have been visible at that time.